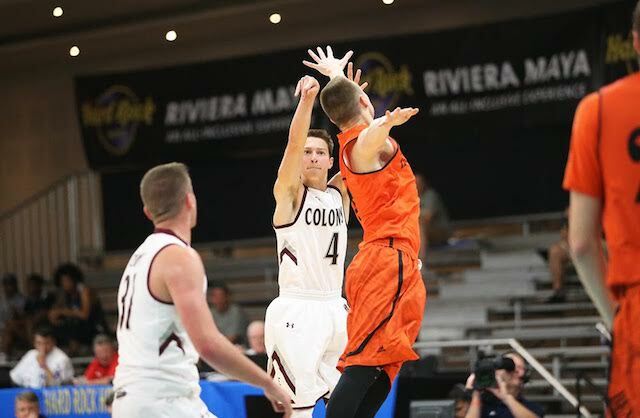 CANCUN, Mexico – The Eastern Kentucky University men’s basketball team drained four three-pointers in overtime to pull away for a thrilling, 91-82 win over Idaho State on Tuesday afternoon in the 2016 Cancun Challenge at the Hard Rock Hotel Riviera Maya. EKU (2-3) trailed Idaho State, 71-69, following a layup by Geno Luzcando with under a minute to play; however, sophomore forward Nick Mayo buried a jumper in the paint with eight seconds on the clock to tie the game and send it into overtime. The Colonels exploded in the extra period. Mayo (1-of-1), senior guard Isaac McGlone (1-of-1) and junior guard Dillon Avare (2-of-2) combined for four three-pointers and junior forward Zach Charles went 6-of-6 from the free throw line as EKU scored 20 points in the five-minute frame to pull away for the victory. Mayo posted a double-double in the back-and-forth affair, scoring 21 points and grabbing a season-best 10 rebounds, seven of which were offensive. He also matched a career-high with four assists. Senior Jaylen Babb-Harrison poured in 20 points and matched career-highs in rebounds (seven) and assists (seven), while Avare finished with a career-high 12 points and McGlone chipped in nine points and career-best five steals. Brandon Boyd scored a game-high 25 points to pace Idaho State. EKU forced the Bengals into a season-best 30 turnovers and converted those miscues into 32 points. The game featured eight ties and six lead changes. ISU ran out to its largest lead of the game, 27-15, following a three-pointer by Robert Jones with 7:28 remaining in the first half. EKU responded with a 13-2 run that cut the deficit to one, 29-28, on a triple by freshman guard Asante Gist with 3:29 on the clock. After ISU pushed the lead back to five, a pair of free throws by Babb-Harrison with seconds on the clock made it 38-35 at halftime. The Bengals opened the second half on a 7-0 run to get their lead back to 10, 45-35. However, the Colonels kept clawing back. A bucket in the paint by freshman DeAndre Dishman tied it at 59-59, and a three-pointer by McGlone with 4:41 on the clock finally gave EKU its first lead, 64-61, since early in the game. Four straight points by Mayo pushed the Colonels’ advantage to four, 69-65, with 2:40 remaining. But, ISU rattled off six straight points to make it 71-69 with under a minute to play. Mayo’s bucket with eight ticks on the clock forced overtime and the Colonels’ perimeter firepower took over from there. EKU will face Georgia State in the Mayan Division Championship game on Wednesday at 3:00 p.m.